Symposium: "Power, Knowledge and Feminism (in Academia and Beyond)"
Feminist scholars have been writing about the politics of knowledge production and the contested status of feminist knowledge for a very long time. It is, arguably, one of the oldest topics of debate and activism amongst feminists and other critical scholars. But those old questions remain open and topical, especially at a time of both intense change – of the nature of higher education, the status of expert knowledge, or the conditions of academic labour – and flagrant continuities (of sexism, racism and other structural inequalities within and beyond academia). This symposium brings together scholars from a range of disciplines who are empirically examining the relationship between power, knowledge and feminism from very different perspectives and across different contexts. It is being organised to celebrate the publication of Maria do Mar Pereira’s new book Power, Knowledge and Feminist Scholarship: an Ethnography of Academia, which will be launched at the event. The symposium will be opened by Prof Nickie Charles (Director of the Centre for the Study of Women and Gender, University of Warwick) and chaired by Dr Cath Lambert (Department of Sociology, University of Warwick). This event is free and open to all, and refreshments will be provided. We ask that participants book in advance to make sure we order the right amount of food and drink. You can book HERE. PLEASE JOIN US FOR THIS DISCUSSION AND CELEBRATION! This symposium is organised by the Centre for the Study of Women and Gender, and the “Inequalities and Social Change” Research Cluster in the Department of Sociology, University of Warwick. A0.23 is located in the Social Sciences building. 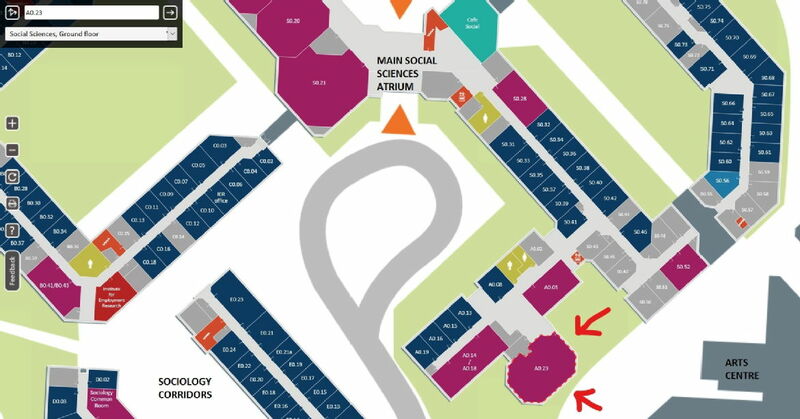 Click here for a floorplan showing the exact location of the room – look for the red arrows at the bottom of the image!